There are two bands with the name Impending Doom: 1) A Christian death metal band from California 2) A Satanic black/death metal band from Germany (now split-up) ----- 1) Impending Doom is a Christian death metal band from Riverside, California. Brook Reeves and Manny Contreras started the band in 2005 with ex members Chris Forno, Isaac Bueno, and Jon. After releasing the The Sin and Doom of Godless Men EP, Greg Pewthers joined on third guitar. 1) Impending Doom is a Christian death metal band from Riverside, California. Brook Reeves and Manny Contreras started the band in 2005 with ex members Chris Forno, Isaac Bueno, and Jon. After releasing the The Sin and Doom of Godless Men EP, Greg Pewthers joined on third guitar. Later, Jon left the band and David Sittig was added to the line-up. Andy Hegg later took the place of Bueno and the band recorded the album Nailed. Dead. Risen.. Forno quit the band in 2007, and the band has since used two guitarists. Due to Andy Hegg's dedication to his soccer scholarship, Impending Doom has had to use fill-in drummers on their tours. Since then touring drummer Chad Blackwell became the official drummer for the band, and with that the band also split ways with Greg Pewthers on good terms and have added Cory Johnson to the line-up. The group signed to Facedown Records in January 2007, and their debut release for the label, Nailed. Dead. Risen., reached number 46 on the Billboard Top Heatseekers chart. The record has received generally positive reviews. The band has since started a street team to promote their music, which can be found on their myspace top 8. The group then embarked on a tour of the United States to support the album in autumn 2007, including dates with Dead to Fall, Winds of Plague and With Dead Hands Rising. In 2009 the band released their second album, The Serpent Servant. The band refers to its style of Christian metal as "Gorship" - a portmanteau of gore and worship. The band also clarify on their MySpace blog that "Gorship" is their way of worshiping God through their gore sounding music; not worshiping "gore" as some are led to believe. 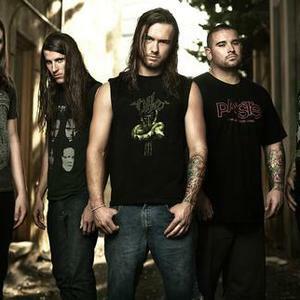 Impending Doom released their second album, The Serpent Servant, on March 31, 2009 which has hit number 3 on the Billboard Top Heatseekers chart, this showed a style change in the band, dropping their previous brutal death metal sound and more into the deathcore genre. The band's third album, "There Will Be Violence," was released on July 20th, 2010. The Deceiver Songfacts reports that Baptized In Filth, their fourth studio album, was the band's first to enter the top 100 of the Billboard album chart, peaking at #98. 2) Impending Doom was a black metal band from Germany. The band formed in 1993 and split up in 2001.